In this Part, we consider how the Stakeholder Working Group engaged with stakeholders (people with an interest in particular issues discussed in the marine spatial plan) and the community. There was a range of engagement activities to promote the project and encourage involvement from different stakeholders who live in the region or use the Hauraki Gulf/Tīkapa Moana. These activities were particularly strong in the early stages of the project. In the later stages of the project, stakeholders could have been better informed and more involved in the project, particularly when options for the plan were prepared and discussed. They need to be informed just as much as groups with detailed involvement in the development of the plan that were part of the project. In our view, there was an opportunity as the plan neared completion to seek the views of stakeholders who had already been involved in groups such as the Roundtables and Hauraki 100+. This could have resulted in stronger support for the plan, and would have made it easier for the Stakeholder Working Group to keep stakeholders and the community informed. There was no structured approach to communicate the final plan to the community before the project ended. In our view, informing the community about what was in the final plan should have been part of the last stages of the project. This would have helped the community understand the work that had been done. In the early stages of the project, various public engagement processes were used to involve communities around the Hauraki Gulf/Tīkapa Moana. Twenty-five "listening posts" were set up that the public could use to share their views with the Stakeholder Working Group and the project support team. This feedback was collated. There were public meetings, several surveys, and a website where information was available. 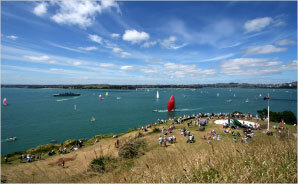 A "Love our Gulf" campaign involved promoting the project at various local events – for example, the Auckland Boat Show. These processes meant that there were various ways for people to provide information and feedback for the project. Those involved in the project had different views on the value of this information. Although many felt that the information was useful to get a sense of the range of public opinion, others felt that the information was not detailed enough or representative of all the different people who lived in the Hauraki Gulf/Tīkapa Moana. The Hauraki 100+ was a group consisting of members of the community who had participated in the initial meetings where representatives for the Stakeholder Working Group were selected. Meetings with the Hauraki 100+ took place during the project, to provide information on how the work was progressing. However, this group was not involved in discussions in the later stages of the project as the plan was being finalised. There was a missed opportunity to involve the Hauraki 100+ and listening-post participants more and discuss the project's progress and detail of the plan in the later stages. Involving them could have been a way to communicate the final plan and gain broader support for it. Seven groups called "roundtables" were set up for interested stakeholders to discuss and come up with solutions for seven specific issues facing the Hauraki Gulf/Tīkapa Moana that the Stakeholder Working Group had identified.13 The groups met one day a month for six months, from mid-2014 to early 2015. Each roundtable had 12-16 members, including representatives from the Stakeholder Working Group and other stakeholders. The roundtables were a useful way of involving more stakeholders, particularly because the Stakeholder Working Group could have only 14 representatives. The structures were well set up and the process ensured that each group fed its views back to the Stakeholder Working Group. Although some of the roundtables worked effectively and came up with specific options for the issue they were discussing, others did not. Some of the roundtable participants told us that they would have liked ongoing feedback on the proposals for the issue they were interested in. These stakeholders would have liked to provide input and comment on the plan as it progressed. In our view, involving roundtable members in the project and considering their views as the plan progressed might have improved stakeholder support for the final plan. Stakeholders who were not involved in the roundtables or Hauraki 100+ told us that they would have liked more regular information from the project or Stakeholder Working Group representatives. They would have also liked more opportunities, particularly in the later stages of the project, to work with the Stakeholder Working Group on the proposals being considered. The Independent Review Panel agreed with this view. Although communication with the stakeholders could have been improved, we acknowledge that this might have been challenging for the Stakeholder Working Group. It might have been difficult towards the end of the project to discuss issues that were not resolved or were still being negotiated, and there was not always time for consultation between drafts of the plan. Some of the perceived lack of communication between the Stakeholder Working Group representatives and stakeholders depended on how the Stakeholder Working Group representatives engaged with the interest groups they represented. More clarity on what representatives needed to do to communicate the plan with their stakeholders would have helped to keep them informed. The commercial fishing sector, in particular, would have liked earlier involvement in preparing the proposals in the plan. In its view, by the time it was consulted, it was too late to have any influence because the proposals were finalised. Some stakeholders felt that the Stakeholder Working Group should not have been able to make proposals for their sector without consulting them first. In contrast to the start of the project, there was no engagement with the community later in the project, particularly when the plan was nearing completion. There was also no communication with the community after the plan was complete and the project was finished. The agencies have not engaged the community about the plan since it was launched. In our view, there needed to be more communication with the community on the final plan. A structured approach should have been carried out. There is limited knowledge in the wider community about the proposals in the Sea Change – Tai Timu Tai Pari plan. If a community is well informed about a project and a plan, people are more likely to support them during implementation. It is important to maintain communication throughout a project. Roundtable groups are a useful way to ensure that there is stakeholder involvement for specific issues. Experienced facilitators are needed to support these roundtables, along with guidance on a process to ensure that the outcomes needed can be achieved. The stakeholders should continue to be involved because they will be important supporters of the plan when it needs to be implemented. It is important to get a wider viewpoint, particularly when debating complex issues. Engagement with the wider community on a final plan provides an opportunity to get visibility and support from the community on the work a collaborative working group has done. This help ease of implementation. 13: The seven issues discussed at the roundtables were: water quality and catchments, Hauraki Gulf fish stocks, biodiversity and biosecurity, infrastructure for the economy and communities of the Gulf, aquaculture in the Hauraki Gulf, accessible Gulf, and mātauranga Māori. Each roundtable had three or more Stakeholder Working Group representatives and other invited participants who had specific knowledge of the topic under discussion. 14: Independent Review Panel (2015), Second Review Report.